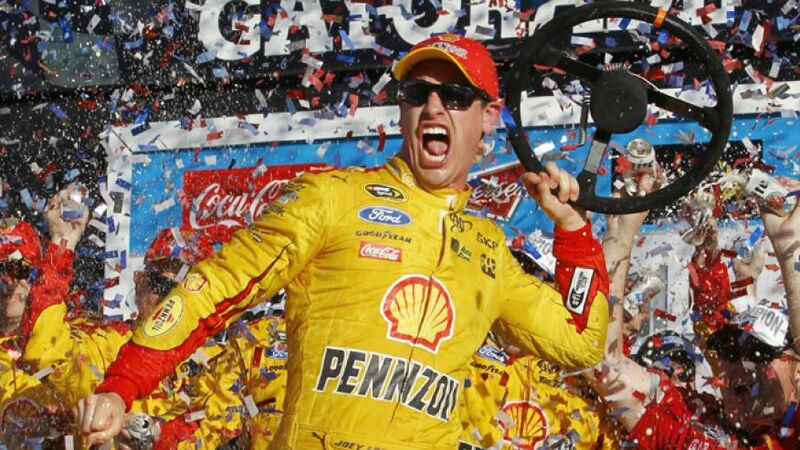 Joey Logano, 24, won NASCAR’s 2015 Daytona 500 over the weekend, launching the young driver into racing superstardom. I interviewed the nine-time Sprint Cup Series winner for the February issue of Boys’ Life magazine. Check out what he has to say about Daytona, dream cars and his favorite racing gear. What makes the Daytona 500 so special? It’s our Super Bowl, the biggest race of the year. There is just so much history and tradition there. It’s the track that everyone wants to win at. You get special feeling just driving through the tunnel each year, and each time you walk out on the grid before the race. My parents got me a go-kart one year and I just started wheeling it around the yard. I tried to play other sports growing up, but I was pretty good at racing. And I loved to do it. So we got an actual racecar when I was six, and I started racing that. What’s the most thrilling part of racing in NASCAR? Winning. We all want to win. And it’s the best thing we get to experience that. It’s so hard to win one of the NASCAR Sprint Cup Series races, and it’s such a team sport. So when you win, it’s just flat-out awesome to climb out of the car in victory lane with all of your guys are celebrating — and the confetti is flying. What does racing offer that other sports can’t? I think all sports offer something different, especially for those that play them. In NASCAR, we compete in our sport for more than three hours straight. We don’t get breaks between plays, or have halftimes. You don’t have to be the fittest person to race, but you have to be mentally fit. You have to focus in very difficult conditions for the entire time. It’s definitely unique. What’s your favorite memory in your career? Everything has been fun. It’s hard to pinpoint one event, because a lot of them people something for different reasons. My first Daytona 500 when I was 18 years old was awesome. Races are long. Do you eat or drink during a race? You don’t really have time to eat, even if you are hungry. And with all that G-force that we experience, it wouldn’t settle that well in your stomach. But we do drink a lot of water and Powerade during races. You have to keep yourself hydrated because the cars get really hot. We race in conditions that are 140 degrees and up, so you lose a lot of water weight. What do you like to do when you’re not racing? There is more to life than racing!? I really have tunnel vision when it comes to racing. Almost all of my time is focused on racing. If we are not at the track, I’m at the Team Penske shop meeting with my crew chief and my guys getting ready for the next race or figuring out what to do to make us better. If I’m not at the shop, I’m at sponsor appearances or doing media. It’s really a full time job. If I can break away, I like to hang with my friends. We just watch movies or play video games. I love to ride on my four wheeler and my side-by-side. And I’m getting married in December, so I try to spend time helping out with that where I can. I like all types of cars. I’m really into unique and classic cars. I have a few cars that I drive around, like an old Cadillac and a cool, old rat rod truck. I’m working on an old Ford Econoline right now. I’m always looking at car magazines and seeing some of the cool old cars that are out there. What is your favorite piece of racing gear? We couldn’t go out there without our suits, helmets, HANS devices and gloves. It keeps us safe in accidents and fires. But I do enjoy the helmets, because you can have fun getting them painted and designed. It’s cool to get to design your own helmet and then see designs other guys have on theirs. It’s unique between everyone. Finally, what advice would you give to aspiring drivers? Make sure you have fun. Racing is a fun sport. But sometimes, kids take it too serious early and they don’t just enjoy it and have fun with it. Don’t forget to take the time to just have fun with it.